Shamrock bracelet is a hinged bangle that features rose gold plating along with crystal accenting. This shamrock bracelet, like all the Irish made jewelry at The Irish Gift House, is nickel free and hypoallergenic. This rose gold plated shamrock bracelet is a hinged bangle that features a crystal studded design that includes crystals set in the front half of the bracelet. The locking bangle features a 5/8" wide x 1/2" tall shamrock along with a 1/8" wide shank; the size is suitable for most women's wrists. 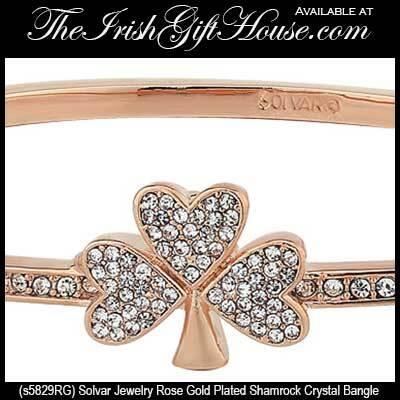 The Irish bracelet is crafted by Solvar Jewelry in Dublin, Ireland and it is gift boxed with a shamrock history card, complements of The Irish Gift House. Shamrock bracelet is a hinged bangle that features gold plating along with crystal accenting. Shamrock bracelet is a hinged bangle that features rhodium plating along with crystal accenting. Claddagh cuff bracelet features a removable or revisable leather insert that is black on one side and white on the other. Claddagh bracelet features shamrock links that are enhanced with green enamel accenting.